This experimental work focuses on the complex autoionization dynamics of Ar2 clusters below the first ionization energy of the argon atom. Ar2 is submitted to vacuum ultraviolet radiation, and the photoelectron spectra are collected in coincidence with the cluster ions. The ionization dynamics is revealed by the dependence on the photon energy. 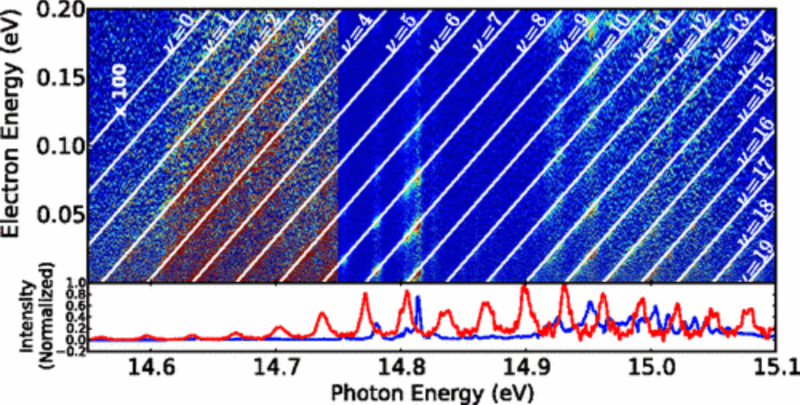 We applied a new experimental method which we developed to analyze the photoelectron signal. Thus, we were able (i) to get the complete vibrational progression of Ar2+ that was never observed up to now, especially identifying the 0-0 transition overcoming the usual Franck-Condon limitations during single photoionization, and (ii) to obtain the projections of the vibrational wave functions of the autoionizing states over the Ar2+ functions. This method provides a powerful tool to test the potential energy curves computed by high level theoretical calculations on Rydberg states.